The symptoms of menopause, including hot flashes, moodiness, sleep problems and weight gain can be disruptive to your life, preventing you from enjoying your mature years. While your doctor is the best person to recommend treatment for menopause, some natural supplements may be effective for providing temporary relief. The oil from the seeds of the evening primrose plant may offer some benefits for menopause. Hot flashes are one of the most common and talked about symptoms of menopause. Sudden feelings of intense heat, most evident in the face, neck and chest, can cause sweating, which can leave you feeling chilled, according to Mayo Clinic. Hot flashes can also cause uncomfortable night sweats, which can disrupt your sleep. 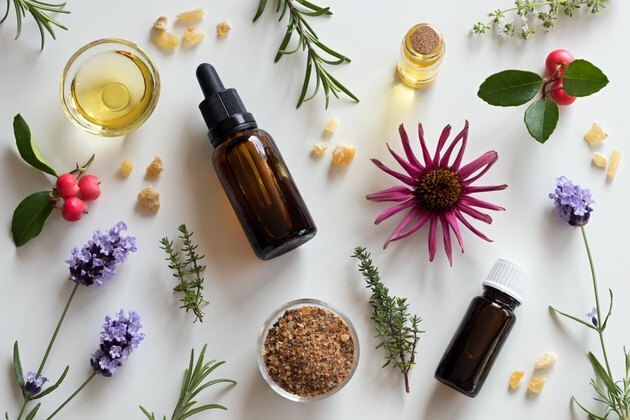 In a six-week trial published in Archives of Gynecology and Obstetrics in 2013, women aged 45 to 59 took 500 milligrams of primrose oil or a placebo daily. Study researchers monitored frequency, severity and duration of hot flashes over six weeks and found that evening primrose reduced the severity of the hot flashes better than the placebo, but didn't affect frequency or duration. A study published in Journal of Education and Health Promotion in 2018 divided into two groups 80 postmenopausal women who were still experiencing hot flashes. One group received evening primrose oil while the other received black cohosh, also among the natural remedies for hot flashes. Results showed that both herbs reduced the severity of the hot flashes and improved quality of life, but only the black cohosh was able to reduce the number of hot flashes. Read More: Can Stress Cause Hot Flashes? Breast pain is usually associated with menstruation, but some menopausal women will experience it as well, according to UW Health. This is especially true for menopausal women who receive hormone replacement therapy. One of the evening primrose oil benefits for premenstrual syndrome is that it can relieve breast pain, and that may also be true for breast tenderness associated with menopause. According to Cleveland Clinic, studies have not shown evening primrose oil to be effective for all women, but it does help in some cases. As estrogen decreases during menopause, the risk of osteoporosis goes up, according to Cleveland Clinic. Osteoporosis leads to weakened bones that are easily broken and to chronic pain in the back and hips. According to University of Michigan Medicine, there is some evidence that evening primrose oil taken in combination with fish oil may be helpful in increasing calcium absorption and promoting bone growth. With the decrease in estrogen, women with rheumatoid arthritis may experience worsening symptoms. Evening primrose may offer anti-inflammatory benefits and therefore be helpful in reducing such symptoms. In a study published in 2017 in the journal Nutrients, 60 patients with rheumatoid arthritis were randomized into three groups taking either fish oil, evening primrose oil and fish oil or no supplement. Results from the 12-week study showed that supplementation of evening primrose oil and fish oil had significant benefit for reducing pain and visual inflammation in the study participants. Reducing the severity of hot flashes can lessen the risk of disruptive night sweats, which can keep you from getting a good night's sleep — one of the commonly reported effects of menopause. Lack of sleep can also cause mood changes. These are potential indirect benefits of evening primrose oil. Is Vitamin E Good for Hot Flashes? Is Saw Palmetto Good for PCOS? Does Evening Primrose Oil Cause High Estrogen Levels?